Life in the Clouds: ....and We're Back! I am so happy to be back, and so excited for the next months of preparation before our founding team of Program Directors and my wonderful co-country director comes down to also discover the wonder that is Guatemala. Right now I am in Panajachel, a lovely town on Lago Atitlan, staying in Hostal Montufar. It is a cute, homey place run by a friendly family. 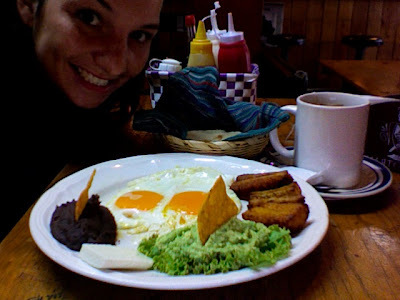 My DELICIOUS first breakfast in Panajachel... You can see how excited I am for it. As it stands, Miss Annie Freyman is due to arrive on June 3rd to help out with the initial site set-up. Annie is newly graduated from none other than Vanderbilt University and served as VP of Global Initiatives for Manna's largest campus chapter there. In her experience she organized eleven spring break trips to either Nicaragua or Ecuador! We will definitely be putting those organizational skills to use, and are so lucky to have her help for 2 weeks till she sets off to teach English in Colombia as a Fulbright Scholar. Next comes Kat Mueller! June 9th I will finally meet the legend and I couldn't be more excited! On a heavier note, if any of you have been reading the news about recent Hurricane Agatha and Volcan Pacaya, I am safe and dry. These past two days, Guatemala has received almost two feet of rain... the most since 1949! Yeeeesss best breakfast everrr. Besides the fruit crepe thing of course. God so good.